An interested crowd watched Her Majesty's Lord Lieutenant of Dorset Angus Campbell officially open the Celebration Arch on on 1 April 2019. A SELL OUT crowd of 84 enjoyed a fantastic FUN Quiz Night at the Preston Village Hall on 22 March. The White Rabbit made a visit and the evening finished with an Aluminium Tubes Race! -- A Mad Evening. Next Quiz is on 22 November.Contact Jane NOW for your Tickets! FOGG Quiz Night -- sold out! Our Quiz Night on 22 March at the Preston Village Hall is a SELL OUT! Thank you to all those who have bought tickets. The Celebration Arch in the Gardens will be opened on 1 April 2019 at 2.30pm by Her Majesty's Lord Lieutenant of Dorset Angus Campbell. The Spring Newsletter is now available. Click into the "Newsletter" Bar above to read your copy. 2019 has arrived!! --- Happy New Year to you all!! A busy Programme of Musical Events has been planned for 2019 in the Gardens. Please check out the Events Page for full details. Part of the roof of the two tier chalet block collapsed in July. No one was injured. The Wishing Well in the Gardens has been broken into the Authorities have been informed. FOGG's Bandstand roof was badly damaged by a December storm. A new one has now been made and is in place ready for the first musical event on 27 May. We have been planning an Entrance Arch for the Gardens for some time. It is to be sited at the entrance on the Esplanade near the seascape Cafe. ​Originally referred to as The Queen Elizabeth II Celebration Arch, because of the wave element it has now been called "The Royal Wave!" The Bandstand in the Gardens was damaged as a result of the Winter winds. A new Structure to take the roof and sides has now been erected. A new covering will be in place before the start of the musical events in May. 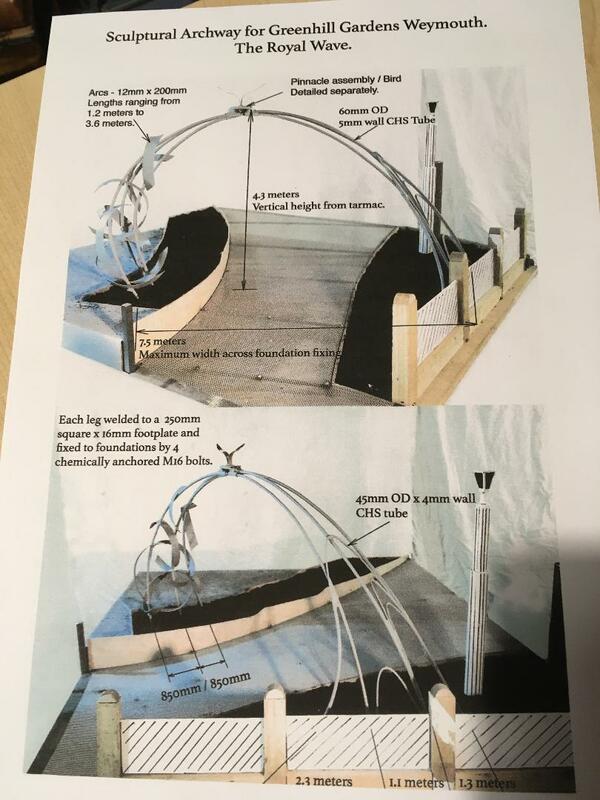 We are commissioning a Celebration Arch to be sited at the entrance to the Gardens on the Esplanade. Please fill in the Consultation Form to leave your views. The Bandstand in the Gardens was severely damaged in the winds of a December night. We will have it restored for the first event of the 2018 season. We are so sorry to say that our planned Singing in the Gardens for 10 December at 3pm has been. Our Christmas Cracker Quiz is now Sold Out. Thank you to all who have bought tickets to support the Event. Half the Tickets have now gone for our next FUN Quiz Night! Get YOUR copy of FOGG's Autumn Newsletter by Clicking on "More" above and then "Newsletter"
Our last Quiz of the year has been eagerly awaited. In just a couple of weeks almost half the tickets have gone! If you'd like to come you will be very welcome, but please order soon. 2600 triathletes swam, cycled and ran from a base in Weymouth on Sunday 17 September. They ran past Greenhill Gardens as part of the competition which is now a major event which hopefully will return every year to Weymouth. Although roads were shut the event provides a major financial boost to the area. On 31 August FOGG Committee Member lain Campbell was invited to the Radio Solent studio in Dorchester to have a chat about the proposed Arch in the Gardens. This relates to FOGG's latest project of designing and erecting an impressive arch at the entrance to the Gardens from the Esplanade. 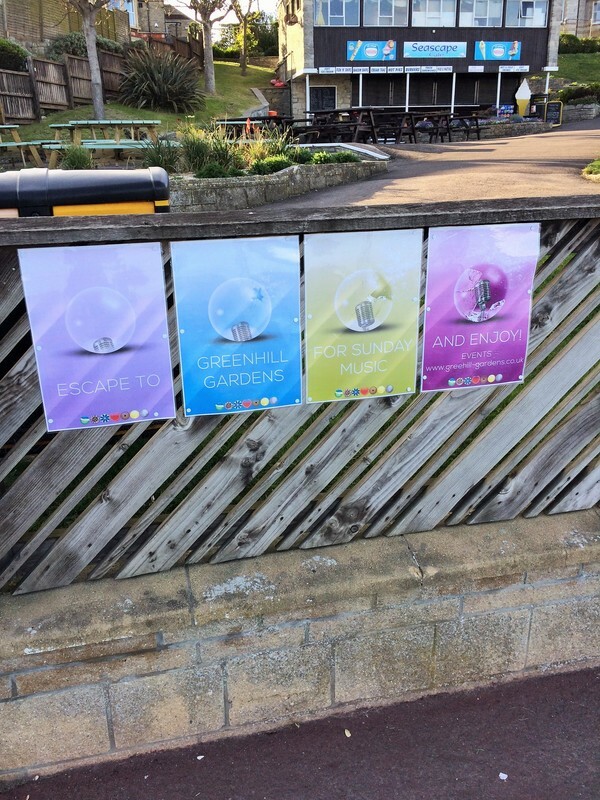 Initial designs are now been discussed and funding is being sought to supplement the monies FOGG have collecting during the past few months from events in the Gardens. It is to be named "The Queen Elizabeth II Jubilee Arch." ​On 13 August we held our Summer Fayre in the Gardens. Hundreds of people came along to enjoy Darron Garnett sing and watch Twirl Academy. Check out some amazing photos of the Gardens taken by Ben Nolan-Stone by clicking "More" and "Photos of the Gardens and Events"
Greenhill Gardens has been awarded with a Green Flag for the Eleventh successive year. Congratulations to the Council and Gardners who keep the Gardens looking great. On Sunday 16 July hundreds of Triathletes raced through the Gardens and into the Tennis Courts. They had finished their swim in Weymouth Bay and were collecting their bikes in the tennis courts for a grueling ride. Then it was back to the start for a massive effort in running! 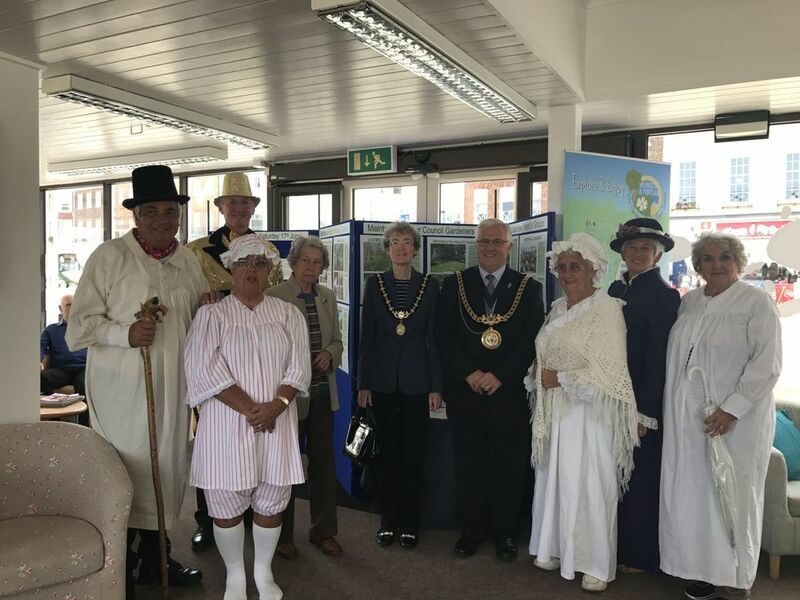 ​All the FOGG Committee Members were dressed in Victorian attire in the Gardens on 17 June to help celebrate Civic Week. Deputy Mayor Gill Taylor arrived and was presented with a bouquet by Katie. Later Queen Victoria and her attendant, a Duchess, processed along the Esplanade and came in to the Gardens for the afternoon. Both received bouquets by Katie and Rosie. The Bandstand was decked with bunting and flags with a floral display provided by Martin Young at MY Plants in Upwey. Hundreds of people thronged in to the Gardens on Sunday 21 May at the start of the season of musical fun. Local band The Silhouettes entertained the crowds as they sat, and some danced the afternoon away. Bright sunshine, blue skies with a bit of wind were the order of the day. FOGG Committee members had a great raffle and collected monies towards the next major project in the Gardens -- An Arch at the entrance. Check out the Events Page for details of all the Summer events. Next one is on 4 June with the incredible Weymouth UkuIeleans -- They are a HUGE amount of FUN! ​Richard Bennett was the son of Alfred Edwin Bennett and Grandson of Alfred John Bennett, Architect and Surveyor of 10 Gloucester Terrace, Weymouth. V H Bennett was his Great Uncle. Much of his time, pre-war, was spent on holiday in Weymouth with his father’s family. The Group’s trip was to re-visit many of the places which were significant to him. Vilat Hackforth Bennett, was a man who went on and played a principle role in Weymouth’s commerce and town council. Vilat became a major participant in the town’s politics, going on to become Mayor at the end of the WWI. He was a man full of big ideas and a view to the town’s future. He wanted nothing but the best for his place of birth. Whilst in his role as Mayor, so frustrated and ashamed did he become at the apathy of the council committee to agree to a memorial for those hundreds of local men who died during the First World War, that he paid for a memorial. Its official title is the Armistice Shelter and it sits in prime position in Greenhill Gardens. So it is a memorial to our brave men who lost their lives during WWI. Vilat Bennett was also the business brains behind the opening one of Weymouth’s largest and busiest department stores in the 1920’s. It went on to become the V H Bennetts, the local’s first port of call for all manner of items. FOGG Chair Barbara Dubben and Graham Dubben were in Portland yesterday to attend a photo shoot for the Big Outdoor Weekend launch. The Dorset Echo featured a photo of some of the groups participating with a write up in the paper on 16 May. See photo on this page. FOGG is a participator in the BDOW Celebrations. -- A number of events are highlighted for the weekend of 20/21 May and FOGG's musical event on 21 May in the Gardens featuring The Silhouettes is one of them. FOGG has now linked in to Facebook to provide more coverage for our activities and the Gardens generally. Getting us set up with Facebook is largely down to FOGG supporter Fiona Higgins. She lives in Corfe Mullen but is a regular visitor to Weymouth and enjoys many of the musical afternoons and Quizzes. So a BIG THANK YOU goes to her! Within an hour of launching the Facebook account we had 45 Likes!!! -- Lots of photos of previous events appear in the Photos pages. The website currently gets about 800 clicks a week and more will be clicking in to get details of the Events in the Summer. ​Thanks so so much for all your Support. 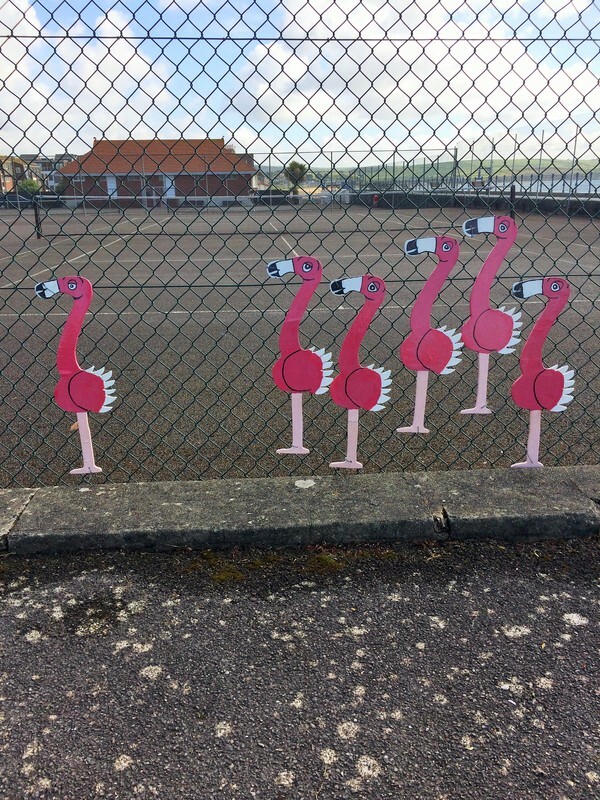 The wooden fish painted by children from local primary schools are back on the tennis courts fencing. It has been described as "The Country's only Waterless Aquarium!" Come and check them out! -- A flock of pink Flamingos will be arriving from some part of the world soon to join them! Each year the Gardens get inspected to see if they meet the criteria for a Green Flag Award. FOGG have an involvement because the Inspectors like to see Community involvement in the Gardens. Members of the FOGG Committee will be meeting the Inspectors with the Council Team next Thursday. FOGG have announced a whole new selection of great entertainment on the Bandstand for the 2017 Summer Season. Check out the Events Page above for full details. The FOGG AGM took place on 4 April 2017 at The Brewers Fayre Lodmoor Weymouth. Chair Trevor Collins and Committee Member Annemarie Collins have stepped down. Come and join in the FUN at our first Quiz Night of the Year!!!.... Scrummy Food and Easy Questions and a whole load of FUN!! ​Teams of up to 6 people. We are delighted to announce packed Programme of Events in Greenhill Gardens for the Summer 2017. Check out the EVENTS PAGE for full details. Many local Dorset Tesco stores have a special area where voting in token form for local projects can take place. Anybody who uses the stores can use their token to vote for local projects. FOGG's proposed Greenhill Gardens Arch is one of the projects! -- So don't forget to use your Vote! Our Annual Christmas Sing Time was held in the Gardens on 4 December 2016 when arounf 70 people came along. A very cold windy afternoon was offset as we gathered in and around the Bennet Shelter. Music was supplied by Lesley Potts and her family and we sang to some delightful Carols. This was intersperced with us all learning a new song "A Christmas Tree, A Christmas Tree, A Turkey Dinner and A Christmas Tree!" -- with actions. Mulled wine and some eats were also provided by FOGG. We hosted a great Quiz Night at The Brewers Fayre Lodmoor Weymouth on 11 November 2016. Easy Questions, Hilarious Fun and a Light Supper were enjoyed by all. We had participants from Bromley in Kent and Lee on Solent. The FOGG AGM is being held on Friday 7 October 2016 at 7pm in The Function Room, Brewers Fayre Lodmoor, Preston Beach Road Weymouth. Members and anyone interested in the work of FOGG and Greenhill Gardens are welcome to come along. The fantastic Weymouth Ukuleleans ended a Summer of amazing entertainment in Greenhill Gardens for 2016. A huge number of groups and singers are being planned for 2017. Watch out for details in the New Year in our Events Page -- Thank You to all those who supported our 2016 Summer Programme. A great warm afternoon greeted the FOGG Summer Fayre with a visitor to Weymouth wining the Lamborghini model car and Rod from Rodwell in Weymouth winning the chirping birds. DARRON GARNETT entertained us on stage with his great voice and arrangements. At 3pm the girls from TWIRL ACADEMY performed their baton swinging routine in the Gardens. COASTWATCH and WELDMAR HOSPICE were also present in the Gardens. ​The FOGG Committee manned the Tombola and Cake stalls. Two Committee members of FOGG painted the bus shelter on Greenhill. Dorset County Council erected a bus shelter near the tennis courts, but it was wasn't a new one and needed some refreshing. The Council were asked if FOGG could paint it and we were given the go-ahead. It looks much better now! The AGM originally scheduled for 1 August has had to be cancelled. We are sorry for any inconvenience. We will give details of the revised date here as soon as it has been confirmed. A helicopter from the Air Ambulance Service landed on the Greenhill Garden's Putting Green. They were attending an incident nearby. JULY 2016 -- Funky Fish swim back! The Funky Fish which were attached to the tennis court railings a couple of years ago have reappeared in the Gardens. They were originally painted by pupils from a number of local schools and now look fantastic swimming in a shoal across the tennis court netting. 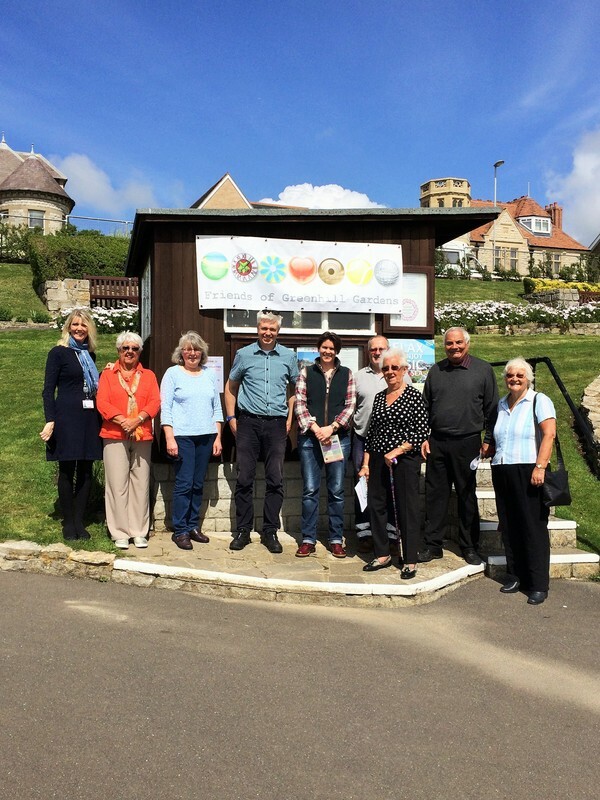 Our AGM will be held at the Seascape Cafe in Greenhill Gardens Weymouth. MAY 2016 -- Cancelled Musical Event is re-booked! Popular Group Replay's performance in May was canceled because of weather concerns. However the good news is that they are to do an extra performance on Bank Holiday Monday 29 August at 2pm. An Event NOT to be missed!! MAY 2016 -- Quiz Night Success!! Over Eighty people enjoyed a fantastic FUN Quiz Night at The Brewers Fayre Pub in Weymouth. -- Questions, Laughter and a good deal of Singing were all enjoyed. MAY 2016 -- FOGG Quiz is another Sell Out!! The ever popular Weymouth Choral Society will be performing a fantastic selection of songs on the Greenhill Bandstand for the first time. Weymouth & Portland Borough Council have applied to themselves for permission to alter the first floor of the two tier Chalet block in the Gardens to provide 10 Chalets and change of use of the cafe to provide another 6 chalets. OCTOBER 2015 -- FOGG Quiz is a Sell Out!! Our November Quiz Sold Out 2 weeks before it happens. Thanks to all who have booked tickets. Singer Darron Garnett will be with us with some great musical questions! AUGUST 2015 -- Vote for the Gardens! The organisers of the Green Flag Award, which the Gardens have won since 2006, have announced a Vote for your favourite Garden competition! JULY 2015 -- Gardens win Green Flag!! Greenhill Gardens have been awarded the prestigious Green Flag Award every year since 2006. FOGG Committee members and representatives from the Chalet owners Group meet David Brown this month. David is the new Head of Assets and Infrastructure at the Council and is therefore tasked to cover the Greenhill Gardens chalets and areas. He prepared a Report for the Council's Management Committee in June for a reconsideration of the future of the Greenhill Chalets and in particular the two tier chalet block. A further site meeting has been arranged. FOGG Committee member Barbara Dubben was presented with a cheque for £300 from Weymouth Rotary. A fantastic contribution towards FOGG's funds. MAY 2015 - Musical Summer starts with a HIT!! MAY 2015 -- Quiz Night is a resounding success! Our latest Quiz Night held at the Brewers Fayre Lodmoor Pub proved to be another great success. Over 80 took part and enjoyed the Fish & Chips Supper and night of fun. Thank you to all who came. The roof and sides of the Bandstand in Greenhill Gardens were dismantled before last Winter. Graham Dubben and his Team have now carried out renovation work on the metal structures and have re erected the Bandstand. It is now ready for the huge number of events planned for this Summer. If you would like to use the Bandstand for one of your events then please contact Trevor Collins on 830448. APRIL 2015 -- FOGG Website is Soooo Popular! Our Website is getting more and more popular. Everyday we have folk clicking in to check it out. On the day before the AGM, 147 people were checking out our site. Thanks sooooo much for your interest! APRIL 2015 -- Quiz is a Sell-Out! Tickets for our May 2015 Quiz have now all gone! Thanks to all those who are supporting this event. We held our AGM at the Brewers Fayre Lodmoor Pub on 24 April. Chair Trevor Collins gave a run down on the year and introduced the projects we hope to complete in the next 12 months. These included bulb planting, possible hand rails and a Welcome Arch.The Accounts for the year showed a balance of £3775.15. Local Author and Speaker Stuart Morris gave a talk on "The History of Wemouth" to finish the evening. Our latest Newsletter giving details about the Events in the Gardens and a host of other information is available. Download one now by going to "MORE" above and clicking "Newsletter" then click on the pdf there. MARCH 2015-- Quiz Tickets now for sale!! We have a fantastic reputation for our really FUN Quiz Nights! They always sell out and the Tickets for the next one have been released! Local Author Stuart Morris will be giving a talk on "The History of Weymouth" at The Function Room, Brewers Fayre Lodmoor Pub, Preston Beach Road, Weymouth. Stuart is the author of a number of books on Weymouth and Portland and his talks are always fascinating. We have registered our Group with Streetlife. They are an Internet based Company with a local appeal. Details of all FOGG events will be mentioned each month and local folk dip in and check out what's going on. -- Some of them even start a dialogue!! ﻿Trevor Collins, the Chair of FOGG has been booking a variety of events as the year comes to an end. He has now agreed a fantastic assortment of great acts who will appear on the Bandstand in Greenhill Gardens. The entertainment starts in May and continues right through the Summer until the end of September. Check out "Events" above for more details. A full list of them will also appear in the Spring 2015 Newsletter. The Council have decided to retain full ownership of the Greenhill Gardens area after their calls for a Group or business to take over part of the area. Only one bid was received and now the Council will consider how further to proceed. Local group Brass Tacks played on the Bandstand as well over 100 folk sang Carols. FOGG Committee Members handed out the Mulled Wine and Mince Pies. The Council's Management Committee who were due to meet in December to discuss the Bid to manage the Gardens has been delayed. The revised date is early January 2015. NOVEMBER 2014 -- FOGG holds Sell Out Quiz Night! Our final Quiz of the year was another Sell-Out and held in the Brewers Fayre Pub, Preston Beach Road. The Winners took away a huge Festive Hamper. Over a thousand Athletes taking part in the "Weymouth Challenge" streamed past Greenhill Gardens this month. They were taking part in a major triathlon event that provided £50,000 in total prize money. The winner took just over 7 hours to complete the course with others taking much longer. They all ran past the Gardens a number of times and into Weymouth. The Council have opened the tendering process for community groups and businesses to take over and run the Gardens. (see more details in The Echo 29 August 2014) Click into 'MORE' above and 'Options for the Future -- August 2014' to get FOGG's views. Weymouth & Portland Mayor Kate Wheller came along to the Gardens with her grandson. She was entertained by Rita Barrington singing on the Bandstand with songs made famous by Marie Lloyd. AUGUST 2014 -- 7 foot Banana is Won!! FOGG's 7 Foot cuddly Banana has been won by Chantelle Hyland. Her mother lives in Weymouth and she is a Student Nurse currently training at Southampton Hospital. She had to name the Banana and she chose the name "Bertie Banana" --- She also wins some Health Lottery Tickets -- Congratulations to her and Thank You to all those who took part in the "Name the Banana Competition." Our planned Summer Fayre was affected by the awful weather this year. Although the rain eased off for the afternoon the wind was very blustery and made the use of the Bandstand unviable. Our Cake Stall sold out and we had the draw for the 7ft Banana! AUGUST 2014 -- Greenhill Gardens wins Green Flag AGAIN!! Congratulations go to the Council's Parks Department and the Greenhill Gardners for their success yet again in winning the prestigious Green Flag Award from the Keep Britain Tidy Environmental Charity. Councillor Ian Bruce also had some kind words about FOGG too....he said "I'd like to thank...the Friends of Greenhill Gardens for all their hard work." A great Summer's entertainment is in prospect on FOGG's new Bandstand in the Gardens. It was opened last year and throughout the Summer most Sunday afternoons will feature FREE LIVE MUSIC! Committee Member Iain Campbell gave a talk to the Park Street Over 50's Group this month about the history of the Gardens and the role of FOGG. A couple of Groups and businesses have expressed interest in taking over a Lease of the area. 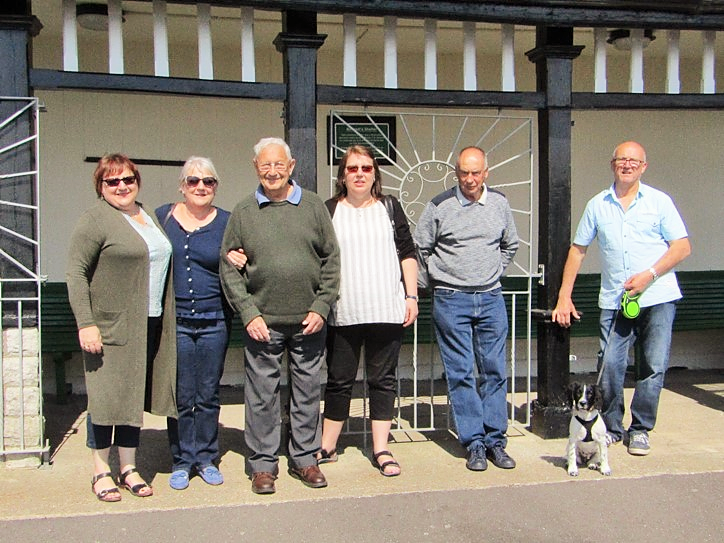 ﻿Our Annual General Meeting was held in the Gardens when we heard Reports by Chair Barbara Dubben, Treasurer Tim Spooner and Committee Member Graham Dubben about the Bandstand. Member Malcolm Lacey gave us the up to date position about the Group "Community of Greenhill." Barbara Dubben stepped down as Chair and Trevor Collins was appointed our new Chair. The finances look good for the year even after a spend of over £5,000 on the new Bandstand. FOGG Member Iain Campbell was interviewed on Radio Solent's Steve Harris Morning Programme about the Consultaion process that the Council are following. Click into "MORE" above and "Council's Sell Off Plans" for a full Report. The Council's plans to sell off part of the Gardens has concerned the residents of Greenhill so much that they have formed an Association to monitor what is going on. 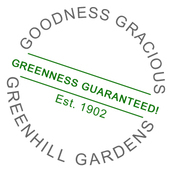 Many of the area's residents are on the Greenhill road itself and benefit from the Greenhill Gardens covenants that the Council agreed to 100 years ago when they accepted the land. They will no doubt want a say if the Council plans involve development in the area. Committee Member Iain Campbell was interviewed by Radio Solent about the Council's latest plans to sell off part of Greenhill Gardens. Public concern has been expressed at a meeing concerning the Council's plans to sell off part of the Gardens. -- For further details see our page "Council's Sell-Off Plans"
We now have our own Key Rings featuring Greenhill Gardens. Over 100 have been sold so far...We think that they'd make a great Stocking Filler for Christmas...Contact Graham Dubben on 782419 for yours. FOGG Committee Member Iain Campbell will be talking on Radio Solent at 10.15am Saturday 10 August about the new Bandstand, The Summer Fayre and the history of the Gardens. The Northamptonshire Boys Brigade Band who have been camping in Weymouth played on the Bandstand this Summer. We're delighted to report that the Council Gardeners have won the prestigious Green Flag Award for the Gardens again this year. Local Group REPLAY performed to an outstanding number of on-lookers in July. A great hot afternoon was enjoyed by all and FOGG had a record-breaking collection and Tombola. Building work spearheaded by FOGG Committee Member Graham Dubben has started on the latest exciting project in the Gardens. A fantastic Bandstand is being erected to provide a focal point for activities in the Gardens. It will enable musical Groups to have a proper base to entertain onlookers. We are hoping to complete the Bandstand in time for the Summer's fantastic afternoon in July with REPLAY. Weymouth has been granted the "Seaside Award" by the Keep Britain Tidy organisation. The Award recognises the Country's shores which have the highest standards of beach management, facilities, cleanliness and water quality. Greenhill Gardens is sited just off the Esplanade fronting the beach. Well Done Weymouth Council. It was sunshine all the way for the Children's Fancy Dress Party in The Gardens on Sunday 26 May. The Gardens have been granted Green Flag status for some years. In June the Gardens will be checked to see if they still comply with the strict criteria....Fingers crossed that the Gardens will be flying the Green Flag again in 2013!! -- The Gardens are looking good, so Well Done to the Council Team. FOGG organised another FUN Quiz Night at The Lodmoor Pub. Great Quiz! Great Fun! Great Food! Spring 2013 -- Those Fish are coming back!! The wooden fish which were attached to the tennis court railings will be making a come back this year. Made and designed by local school children, they add a wave of colour as the fishy school swims along the fencing. The 10,000 crocus bulbs planted by the Lions Club and FOGG Members have appeared again in the Gardens...They make a great purple spectacle. FOGG's Carol Service in the Gardens proves to be another success. A chilly but dry afternoon saw adults and children gather together for Christmas Carols. All enjoyed the warming mulled wine and mince pies......delicious! We Officially launched this website with a photo-call in the Gardens. Councillors Ian Bruce and Joy Stanley came along together with the Gardners who look after the area. Most of the FOGG Committee were also there to see one of the Gardners cut the celebratory ribbon! August 2012 – DONATION OF TABLES FROM SCOTS IN BOURNEMOUTH -- The Bournemouth Caledonian Society has kindly donated 8 very sturdy trestle tables to FOGG. The gift is very much appreciated. The Arch --The Royal Wave! In the Gardens in May 2017 were a group visiting from Wales. They were particularly interested in the Bennett Shelter which has a family connection. In the picture, left to right, are Sue Jordan (nee Bennett); Anne Gabriel (nee Bennett); Richard Bennett; Gill Musto (nee Bennett); Anthony Musto and Len Jordan with Daisy. (see more left about the Bennett visit. 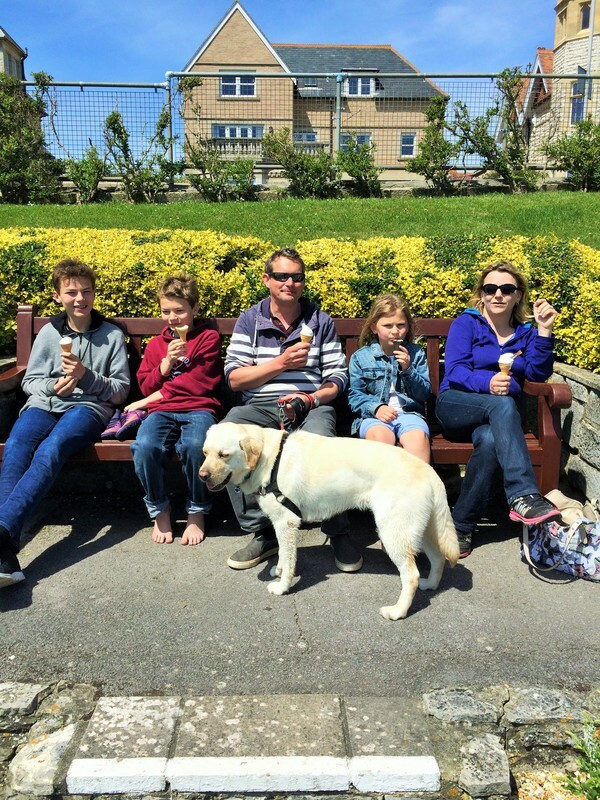 In May 2017 The Fisher Family from Southampton enjoy ice creams in the Gardens -- Good to see you all.... Please come back and have some more ice creams!! 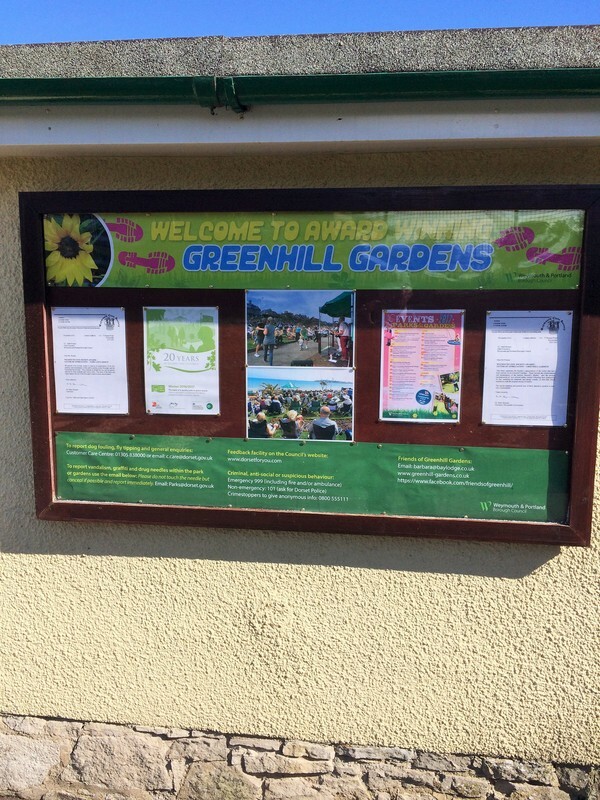 In June 2017 the Council refurbished and improved the noticeboard sited at one of the entrances to the Gardens. Looks great! July 2012 – THE GREEN FLAG FLIES AGAIN -- The Gardens have been awarded the Green Flag of Excellence again! This is a National Standard of Excellence for Parks and Green Spaces. Well done to the Gardeners and all involved in keeping the Gardens looking FAB! 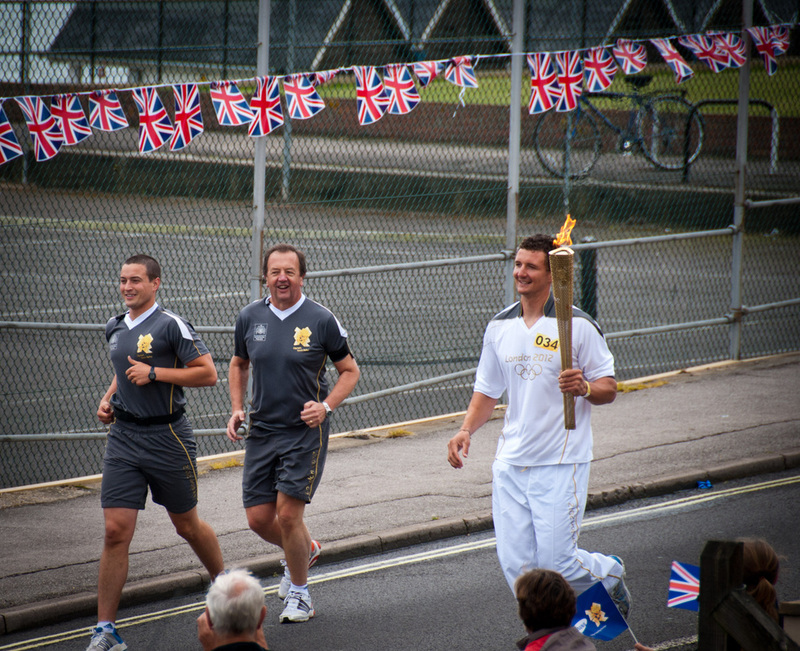 July 2012 –THE OLYMPIC TORCH IS CARRIED PAST THE GARDENS – The journey to London of the famous Olympic Torch took it right past Greenhill Gardens. Crowds watched and cheered the holder as he made his way to The Lodmoor. It then travelled on that day to Bournemouth. July 2012 -- FISHY GOINGS – ON!--FOGG Members helped to erect 150 wooden fish on the Tennis Court fences in August 2011. They were taken away last winter but have now re-appeared thanks to the Gardeners. They were all painted by children from local schools. – Now we have a shoal of fish swimming in the Gardens. Who’d have believed it!!? Click here to follow us on Facebook for up to date news and events! 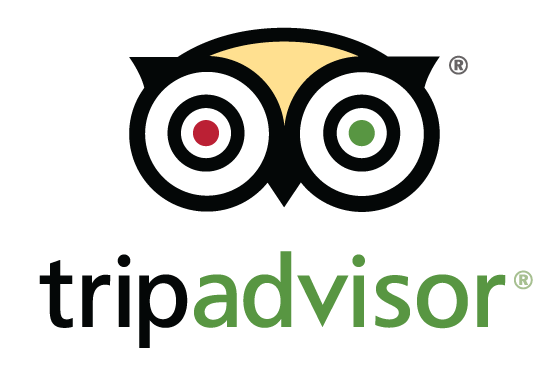 We are in the top ten list of 'things to do in Weymouth' on Tripadvisor and have over 140 visitor ratings as 'excellent'! What's the weather like in Greenhill Gardens TODAY?